This time I’ll give two related problems, both not too hard. You have a mapping between items and probabilities. You need to choose each item with its probability. For example, consider the items ['good', 'bad', 'ugly'], with probabilities of [0.5, 0.3, 0.2] accordingly. Your solution should choose good with probability 50%, bad with 30% and ugly with 20%. I came to this challenge because just today I had to solve it, and it seems like a common problem. Hence, it makes sense to ask ‘what is the best way?’. Assume a bell shaped function p(x) that you can ‘solve’. This means that given a value y, you can get all x such that p(x)=y. For example, sin(x)^2 in [0,pi] is such a function. 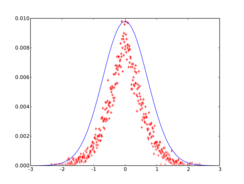 Given a function such as Python’s random.random() that yields a uniform distribution of values in [0,1), write a function that yields a distribution proportional to p(x) in the appropriate interval. For example, consider the function p(x) = e^(-x^2) in [-1,1]. Since p(0) = 1, and p(0.5)~0.779, the value 0 should be p(0)/p(0.5)~1.28 times more common than 0.5. As usual, the preferred solutions are the elegant ones. Go! note: please post your solutions in the comments, using [ python]…[ /python] tags (but without the spaces in the tags). 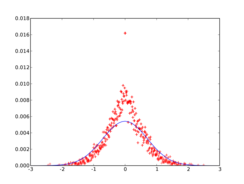 This entry was posted in Challenges, Math, Programming, Python and tagged challenge, probability distribution, Programming, Python, random selection, Statistics. Bookmark the permalink. By the way, an obvious use case is generating a sequence of elements using a Markov Chain… That’s just what I was doing today. Oh well, so I’m bored. I’m quite sure there’s a better way to do it, but whateva. 2. it is a bit too wasteful (especially for such large n). I must say though, I also thought of this solution at first. That was because in my use-case the probabilities were generated from a histogram of the items, so each item had a natural number of appearances. While this solves away the problem of the exact distribution, it is still not the ‘right’ solution. Consider a Markov chain generated from a large body of text. Now, I would like to generate a sequence of words according to this chain. I would have to create a such a population for each word in the chain. I did not look at other solutions before coding my two that are below. Of my two, I would like to check for applicability then go with the simpler, memory-hungry probchoice2() if possible over the more than twice as long probchoice(). The test info given is not repeatable and must be checked by hand – In a production environment I would need to select some delta and ensure calculated probabilities are within delta of the input probs. And looking at lorq’s comment to Miki, I had thought of precision and made my bin count selectable. I’m working on a PC with a gig of ram, and thought that working to three digits of precision as the default would be OK.
“You have a mapping between items and probabilities. You need to choose each item with its probability. with probabilities of [0.5, 0.3, 0.2] accordingly. then uses random.choice() to select items. If you could rewrite probchoice to be fast, short and elegant, would you consider it the better solution? 1. I like the tests. But that aside, I’m currently adopting a measure of quality that is “quality meets the spec”, and in which work to exceed a spec after it is already met, detracts from quality. If a spec is vague then it is important to seek out a refinement to the spec. so that you can guage the quality of your code. 1: I couldn’t see myself finishing it in an evening. 2: Could you go into more detail? Maybe with sample input/output? 3: I don’t think I could make much use of any result – it would probably be too complex for training others (too much time spent explaining the task, too much time needed to go through a solution). Generally I agree with you. If you’ve got a solution that works and meets the spec, that’s enough. However, in this case this consideration is moot – we are talking about a challenge where the target is elegance and having fun solving it. 1. This solution is correct for any probability distribution. 2. It is O(n) for set-up and O(lgn) for each call to next(). 3. There is a single caveat, I am assuming the probabilities sum up well to 1, which with floating point numbers might not always be the case. To be on the safe side the last element might be replicated with probability 1, just to make sure there are no out of bounds references. Numpy’s cumsum() (cumulative sum) is a good function, quite useful. Before I knew about it I wrote one of my own. About bisect though… I don’t like the name. I think it’s one of the least aptly named modules in the Python stdlib. Still very useful to be aware of. Probably should have been named ‘sorted_find’ or something similar. 1. It is more of a mathematical challenge. When I first thought about it, it didn’t take me too long to solve it(<0.5hr). The solution is simpler than it seems. It may also be solved generally for any distribution continuous in [a,b], but the generalization is more complicated, and I don't know of a better way to solve it. 2. Regarding use-cases. Well, I came up for this challenge independently. To find uses I did a Google codesearch on Python's random.normalvariate() and as an example, found jitter delay in communication code. Another example was particle systems. I guess you could find other usages. 3. Here is an example run of the my solution to the second problem. I don’t know if the apparent error in the middle is because my solution is bad, or because my measurement is bad. I’ll be *very happy* to see a good solution and a good proof. I almost forgot… about the email, well, statusreport originally emailed his solution instead of putting it in the comments. Indeed I had a bug in the measurement code. I used int(x*100) instead of numpy.floor(x*100) which gave 0 a result that’s twice as much as it should. Once that bug was out of the way, I could use max instead of an average, and here is the resulting graph. Here is a solution which maps the probabilities to ranges and an empirical proof. I am not sure how to submit code here, so I hope this is properly formatted!